Up (a bit later than planned), walked Mix and then set about emptying the front of the carriage store to provide access to the boxes of books (hundreds of them). Sandy arrived and continued to do some weaving on the loom. When he left Rachel and I loaded the front of the carriage store (if you see what I mean) into the Stables as they will not be used again until after Christmas. 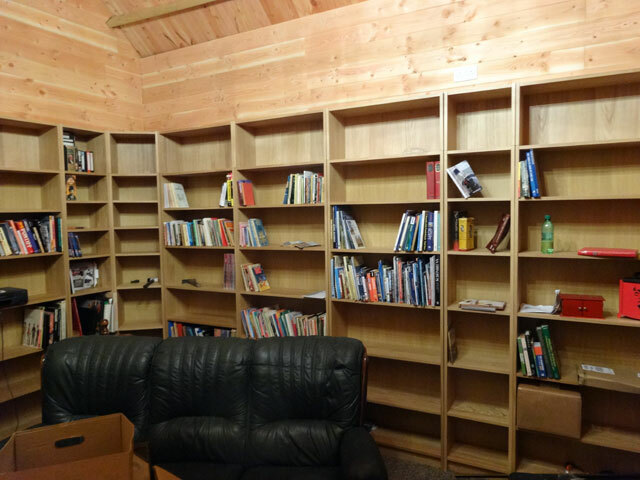 Together Rachel and I loaded boxes into the Barn and started putting books on the shelves. It will be a long exercise – but we have allowed ourselves until the end of December to complete it. I lunched on the remains of my Chinese take-away from last night and later in the afternoon David arrived for a coffee, bringing with him the small vacuum which had had repaired – very clever, David. I set about providing electricity readings for the electricity company and discover that we are using a fraction of the electricity that we used last year – and that it is very much cheaper than before. My new company really is such an improvement. It certainly does pay to shop around and to switch to get the best deals. We all dined in the farmhouse and then Rachel and I relaxed in the Granary. I watched University Challenge and then dozed until it was time to go to bed. I’m told that it is not as cold today as it was yesterday, well, it seems pretty cold to me.